So I forgot to review episode 2 of Sailor Moon Crystal due to going on vacation and now since I’ve watched episode 3 I’ve decided just to put both episodes together into one review. Alright so in episode 2 we were introduced to Ami the insanely smart and adorable girl who would ultimately become Sailor Mercury. I loved this episode it was very similar to the manga and it a way the episode was also pretty sad. The only reason why I say the episode was sad was due to how people were talking about Ami. Alright now the transformation sequence and attacks were utterly awesome!!!!!! 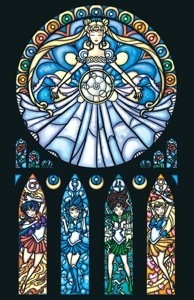 I love Sailor Mercury’s transformation and how her attacks were animated. Definitely much better than the 90’s anime but that anime still definitely has a soft spot in my heart. Now on to episode 3! Episode 3 was were we got to meet the mysterious and gorgeous Rei also known as Sailor Mars! She is utterly gorgeous and that is also why she is my favorite Sailor Scout besides Sailor Moon of course. But anyway the episode was very similar to the original episode that she was introduced in where a bus is mysteriously disappearing with it’s passengers near the temple grounds that she is the priestess at. The biggest difference that I saw in this episode was that all the Shitennou were introduced and it was nice to see that Zoisite was male like he was supposed to be. Once again though Sailor Mars transformation sequence and attacks were awesome and different from the original. Absolutely loved the episode and fell even more in love with the Sailor Mars character. Oh yeah one last scene to being up is the bus scene between Mamoru and Usagi. That scene was just soooo cute and I can’t wait for there to be more subtle romantic scenes between them. Plus Mamoru is hot especially with his glasses on. Love his animation as well in Crystal compared to in the 90’s anime. Also one thing that I have noticed is that all the characters faces are drawn very doll like which I love. Alright so stay tuned for another review of episode 4 in a few weeks!